In our previous note, we had expected 100-DMA to stand as important support for the Markets and had also not expected the Markets to show any runaway rise. In line with this analysis, the benchmark NIFTY recovered smartly from the lows of the day taking support at the levels very near to 100-DMA. It ended the session with minor loss of 9.50 points or 0.09%. Going into trade on Wednesday, the broader levels to watch for remain the same. Critical support is expected at the 100-DMA which stands today at 10070 while up moves will face resistance in the 10180-10200 zones. Given these resistance levels of 10180-10200 zones, any movement past these levels will see some short term momentum in the Markets. We expect a modestly positive to flat start to the day on Wednesday and the Markets are expected to attempt an technical pullback after finding base around current levels. 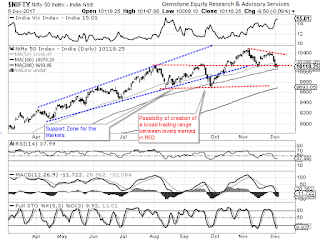 The Relative Strength Index – RSI on the Daily Chart is 37.9889 and it has marked its lowest value in last 14-days which is bearish. It shows no divergence against the price. The Daily MACD stays bearish while trading below its signal line. On the candles a Doji has emerged. Occurrence of Doji can be significant and not-so-significant depending upon the place of its occurrence. The current formation of a Doji is relatively significant because of two reasons. The NIFTY has tested its lower Bollinger Band value and also this coincides with the 100-DMA which is a major support level for the Market in the immediate short term. Reading the occurrence of Doji in this context, we can expect it to cause a technical pullback. The Markets in general will also react to RBI’s Monetary Policy Review. RBI is expected to keep the rates unchanged and skip this time and lower it due to current inflation levels. But this being aside, it is very much likely that the Markets may continue to remain in a range with a bias towards some pullback. In event of any downsides, the levels of 100-DMA will act as a potent support. Continuing to remain highly stock specific and maintaining modest exposures is what is advised for the day.